Health chiefs in the Highlands have scrapped plans to downgrade maternity services. NHS Highland had considered removing consultants from the maternity unit at the Caithness General Hospital in Wick and leaving midwives in charge. But campaigners argued the move could threaten lives with expectant mums being forced to travel more than 100 miles to Inverness for treatment. 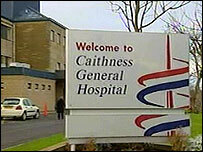 The health board said it would recruit three obstetricians at the unit. Garry Coutts, NHS Highland chairman, said the decision had been reached after listening to medical concerns over the shake-up. "We had very serious concerns expressed to us by our most senior doctors," Mr Coutts said. "I think it would have been wrong for the board not to have examined those concerns thoroughly. "We have looked at other ways of providing a maternity service that would meet the requirements of our doctors and the community." Mr Coutts said the health board's efforts to find a new maternity model with the help of the local community had proved unsuccessful. He added: "So we feel what's best now is to try and move ahead with a service by looking to recruit three obstetricians."